Hello and welcome to our Porsche dealership, located in Farmington Hills. We have been providing vehicle sales and support to this community for many years. It is important to our dealership that all consumers in the Detroit area have the luxury of shopping for a high-end Porsche vehicle. The reputation that we hold in this area is largely thanks to the incredible staff of sales personnel and service technicians that we have on site each day. We stock a large selection of used and new vehicles. We have all of the current Porsche inventory on site, but we also have many different makes and models of used vehicles. Whether it’s a Cayman, a 911 or a Macan, we have it here and we will ensure that you are an expert before making a final decision on what vehicle you desire. If you are in need of a vehicle on a budget, or you want to make a splurge on something you’ll have for a lifetime, stop down to Porsche of Farmington Hills for more information. Here at Porsche of Farmington Hills, our clients are all given the opportunity to purchase or lease a vehicle. Leasing provides clients with the opportunity to drive a new vehicle without having to make a long-term commitment to expensive repairs and maintenance. Leasing allows you to choose a vehicle that you will have for a couple of years. For example, you can lease a new 2018 Porsche Macan for as low as $699 a month! Leasing is a great option for those who want a new vehicle every few years, or those looking for smaller monthly payments. After that contract is up, you can choose what you want to do next. You can choose a new vehicle to sign a lease with, you can walk away from your current vehicle or you can take a little bit of extra time to figure out where to go next. If you are more interested in purchasing a vehicle that will be yours for many more years to come, this is an option as well. We can provide you with any financing information or assistance that you need at this time. One of the most impressive things about our dealership is the large variety of vehicles that we keep coming in at all times. If you haven’t found what you are looking for, you’ll definitely find it at Porsche of Farmington Hills. Don’t forget, we have much more than just Porsche vehicles. There is a very extensive used lot on site as well. Let us know what type of vehicle you are looking for. We’ll help track down your dream vehicle. We have some of the smartest and most well-trained service technicians in the area. We work closely with them to make sure that all of the vehicles on our lot are safe and reliable. Nothing gets put up for sale before a thorough investigation is completed. Routine maintenance is something that is very important for your vehicle. Without it, you can’t expect to have your vehicle run smoothly for very long. From a routine oil change to a yearly inspection, we can provide you with all of the maintenance that your vehicle needs. Don’t forget, a little bit of attention to your vehicle now will save you a lot of time and money later on down the road. If you would like to find out more about our inventory of vehicles, stop down to the Porsche of Farmington Hills dealership. Our customers always come first, and we’ll make the process of picking out a new vehicle simpler than ever. Made an online inquiry about a vehicle that was still in transit. Dan Kelley instantly responded and kept in contact throughout the delivery and purchase process. He along with Nick Benuska made the whole process quick and seamless. Looking forward to my next purchase at Porsche of Farmington Hills! Incredible customer service and attention to detail from start to finish. A great Porsche dealer to buy your dream car! 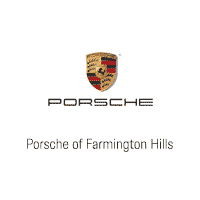 Porsche of Farmington Hills	42.467667, -83.420609.